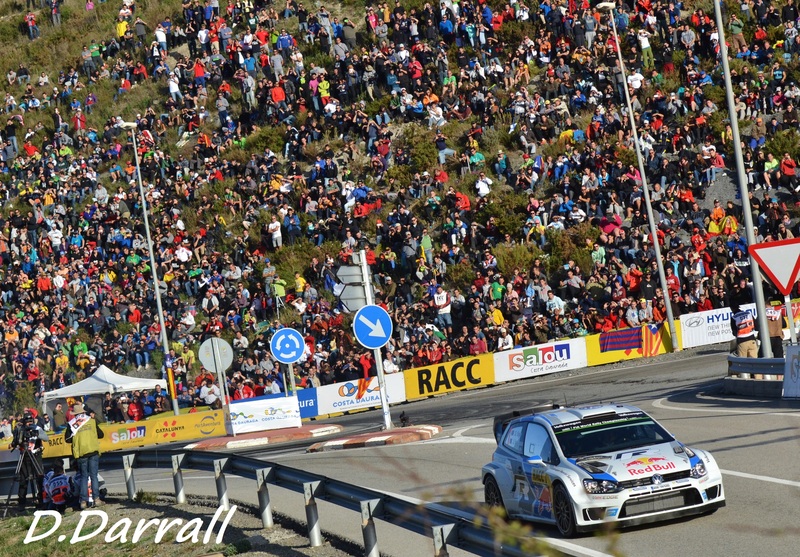 Doing the final two rounds of the 2014 WRC season was a good choice. Especially with all the goings on in and around the sport. So where do I start?.. RACC Rally Spain. What an event. The atmosphere of the crazy local fans, the excitement of the championship title being decided. It was a very exciting weekend. For the price of a muddy hill-side in the frost biting November temperatures with some confused sheep, you could come to Spain because the stages are free to spectate on. Yes I know it works differently in GB compared to Spain, with forest commission roads charging for the use of the roads ect, hence the £100 weekend rally stage pass. But still, that is a big chunk of money which could be spent on jetting off to the heat of the Spanish countryside. And it was a hot one this year too. However, having said that Rally GB is an absolute classic, with the most challenging conditions and incredibly fast roads, meaning that the only way is sideways. And There just isn’t a better way to end the season than with some singing Welsh sheep! Once you get over the fact that WRC is fun not Glamorous, man up a bit and wrap up warm, then watching Wales Rally GB is a very special experience. So two very different Rallies but both perfect to end a great season. So….. why do one when you can do both! Back to Spain, the sun, the heat, and the amazing fans. On Thursday we watched the sun rise over the rides of the theme park in the distance to the sounds of WRC cars working their way up the road to the shakedown start. 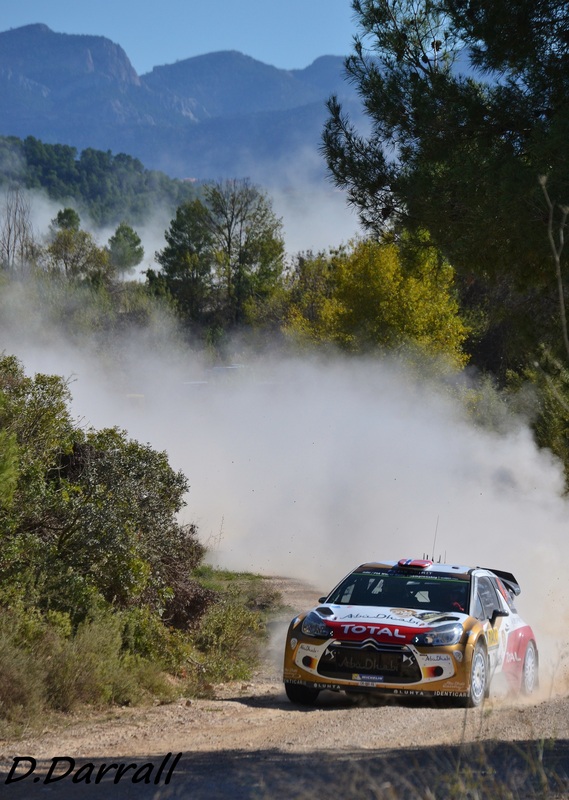 Meeke drove like his grandmother, making sure he saved every tread he could on his tyres for the proper stages of day 1. 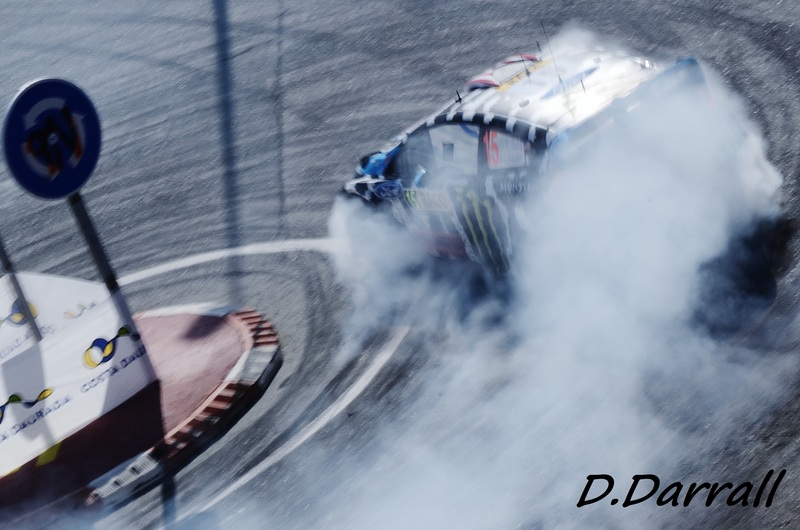 Ken Block on the other hand, turned his tyre treads into screaming smoke as he drifted his way around the round-about, much to the excitement of the fans. Then off to Barcelona for Stage 1. Must admit, I never understood the point of the last few years, doing just the Opening Ceremony there, just to then drive all the way back to do a stage 20 mins from base in Salou. But to do a stage around Barcelona was brilliant! Most people such as locals and tourists didn’t have a clue what was going on, but they loved it. 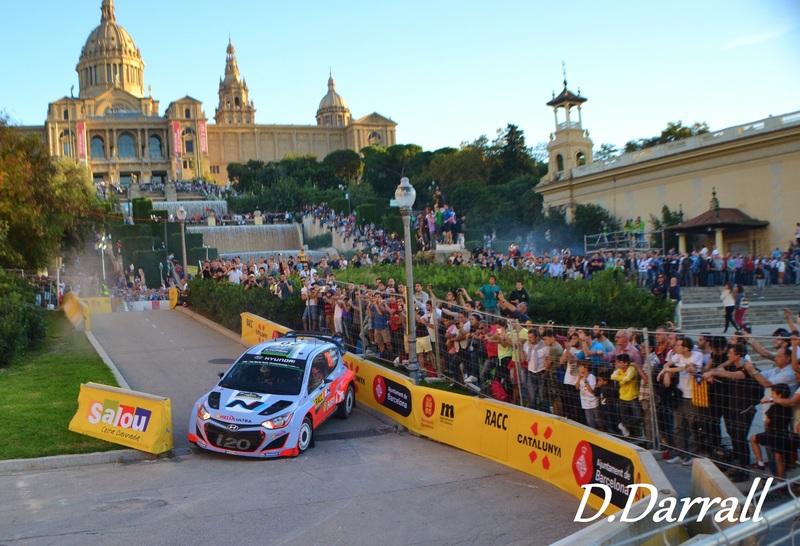 It brought new fans and people in, it took rally to the people and with a stunning back drop. I’ve never seen so many people at a Street stage. A great decision by the organisers I thought. And with a mandatory donut in front of that amazing palace and all the waterfalls was a beautiful sight. Day 1 was on gravel, and despite dust issues, it really spiced things up, especially for the championship. Latvala needed to win and have Ogier suffer a problem. Latvala the flying fin, the gravel master, this would be his best chance. But it seemed he was so focused on how he would perform on the tarmac, he forgot how to drive on Gravel! One man who didn’t have such a problem was Kiwi star, Hayden Paddon. 12 months ago he debuted in WRC on this event. 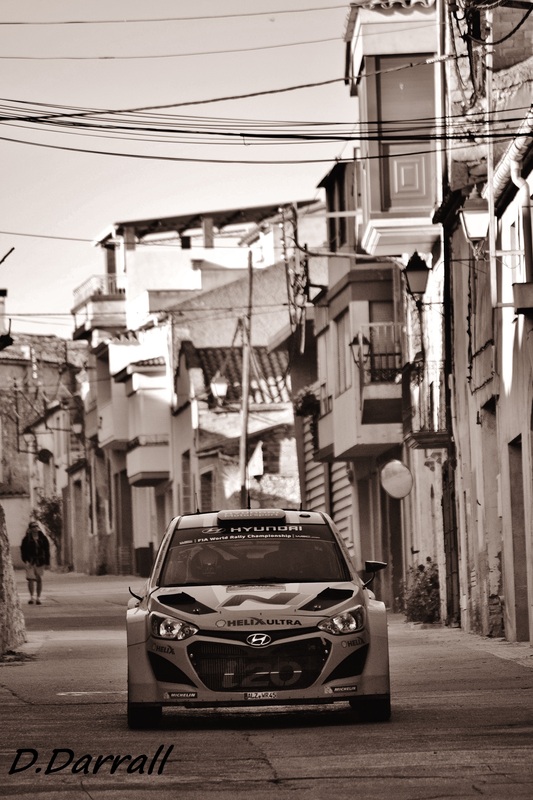 (see Paddon’s WRC Debut Video) Now in a Hyundai he went out and scored his first Stage win. My driver of the day, despite nearly binning it the stage after, he was comfortable enough to start finding his limits and pushing over them at times. He seemed happy and certainly found a step up in pace. When I asked him where he found that pace he said, “I’m just a lot more comfortable with the car on Gravel now.” Seeming even more calm and relaxed than usual, I asked him if it was because he already had news on next year. He had nothing that he could confirm officially, but would be happy to be there again next year. In other words – Watch this space! His senior team mates however were confirmed for next year. Neuville doing the full season, with Dani Sordo doing 10 rounds. Elsewhere, Volkswagen had signed all their drivers up again for next year, and also Meeke was apparently in contract talks with Citroen for next year, but nothing yet signed or confirmed. Seb Ogier had his eye on the crown and by the end of the gravel day he had a 36 second lead over team mate Latvala in 2nd. Day’s 2 and 3 were all about Latvala trying to make up the lost time from day 1. And the Fin gave it a bloody good go on the final day. His drive on the final power stage is certainly one to watch, taking every cut and more, foot hard to the floor, giving it everything he had. Latvala was definitely the driver of the day on the final day, and the fastest, but it just wasn’t enough. 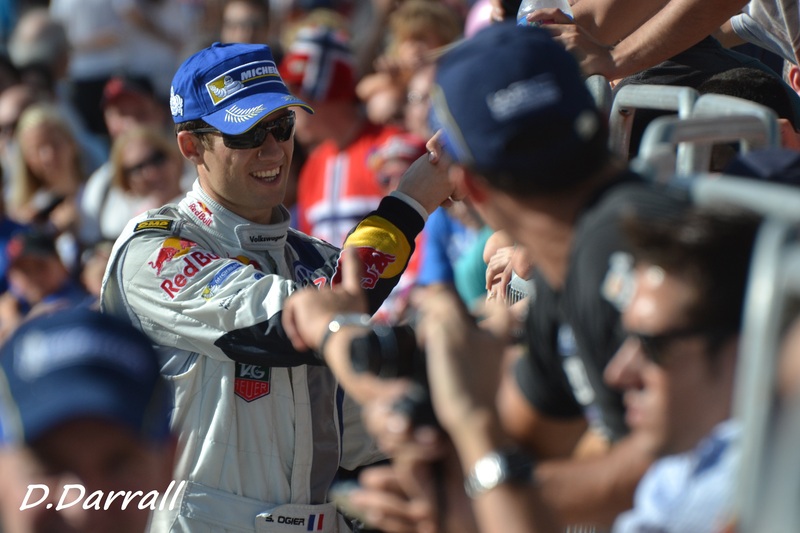 Seb Ogier came across the line as the new double World Rally Champion. 7 more of them and he’d be the new Loeb. The atmosphere really hit fever pitch on that final stage. The crowds were wild, and would cheer anything, of cause being hyped up by a man with a trumpet helped (see Best Fans in the world Video)Ken Block was a star, and gave us extra donuts and extra burning rubber on the Riudecanyes round about, or ‘Roundy Roundy’ stage as Paddon calls it. However later on in the stage, Kenny from the Block got a puncture and ended the rally on the Rim and finished 12th. But was still great to see him bring so much support to the WRC. Back to Salou and it was party time. Ogier didn’t put a foot wrong, except for when he put his foot through his windscreen while jumping on his car on the podium. And ended a great rally by celebratory donuts on the Salou seafront. What an image that was to see. 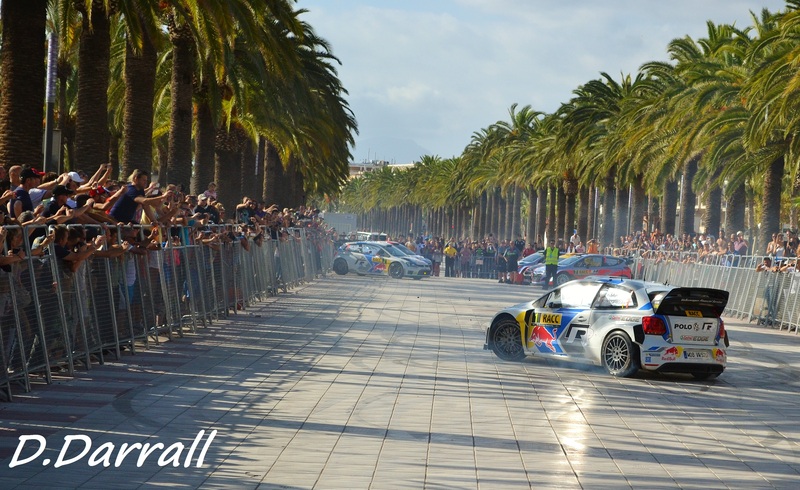 The Palm trees, the baking sun, the beach, the rally cars parked up and the new double World Champion, Burning rubber, crowds cheering, what a way to end a weekend in Spain. Now onto the season end. It’s a free for all. No championship to worry about, just one big push by everyone for the win. The news of Mikko Hirvonen ending his 13 year long WRC career here in GB will make it even more special. And we hope he can push hard with lots of ‘Sisu‘ for a good result. Of course we also have the Brits back. 2002 was the last time we had 2 British drivers racing on our home event. 12 years later we have Kris Meeke gunning for a win, Elfyn Evans a Welshman hoping to impress in Wales. VW’s Mikklesen who is hungry for it and has a do or die attitude for this weekend. On top of that we have a returning Henning Solberg, and also Matty Wilson, in a Fiesta RRC car with livery to match his old mans RS Cosworth from 94. And then of course…. The big boys. This is an event Latvala knows better than anyone, and was 17 when he first came here. But he will have Ogier hot on his heels. The Wet, Cold, sheep filled Welsh hills will make for one heck of an end to a brilliant season. It could get messy, Bring on the Mud and Glory! 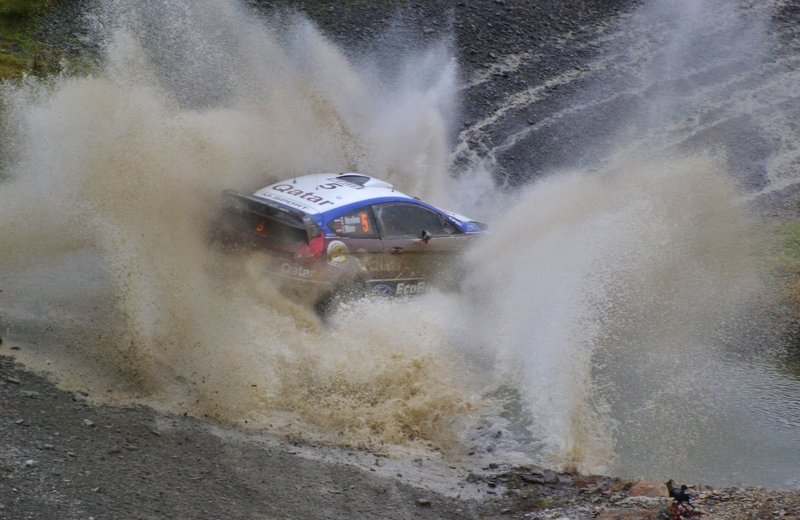 This entry was posted in Dan's WRC Blog, WRC and tagged Citroen, ford, GB, Hyundai, Sheep, Spain, Volkswagen, Wales, WRC. Bookmark the permalink.